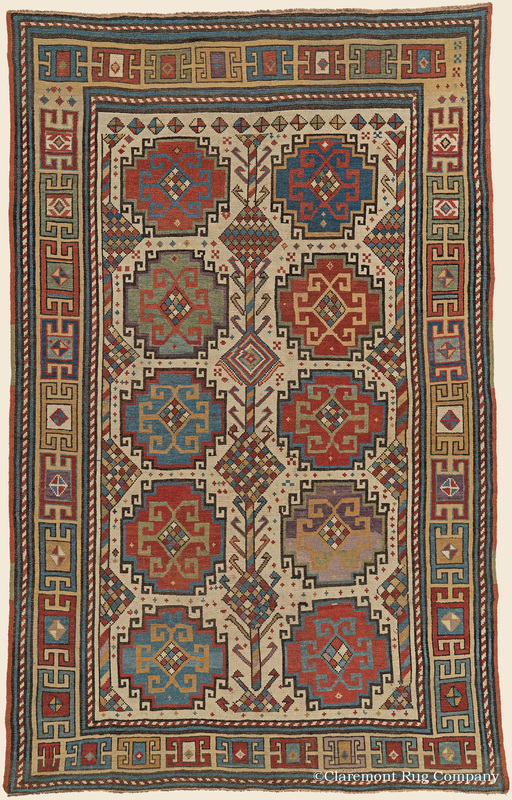 Search Our Inventory / All Rugs / 4&apos; 2" x 6&apos; 6"
4&apos; 2" x 6&apos; 6"
(High-Collectible) ("Best-of-the-Best Sold in 2018") Abounding with graphic, creative energy, this is a highly ingenious specimen of the prized Moghan tradition that is filled with an unusually elemental, extraordinarily spacious pattern of vastly overscale design elements.We have very seldom encountered such an early example from this rarely produced 19th century weaving group. Reflecting the more minimalist aestheic of the time, ifs remarkably vibrant, yet mature colors and idiosyncratically rendered iconic motifs are eloquent. Throughout, expert dyeing is evident in rare tones such as Tyrian purple and bronze gold.